The location of the Hotel Estudios Tropicana, 300 meters from the sea, 1.5 kilometers from the beach of Port del Torrent, 4 kilometers from the center of San Antonio and 16 kilometers from Ibiza airport, is perfect for discovering the most beautiful places Of the island and to enjoy an unforgettable vacation with your family, couple or group of friends. Our hotel is located in one of the quietest areas of Ibiza. It enjoys a relaxed atmosphere and offers a wide variety of entertainment options for all: shops, shopping centers, restaurants, terraces and clubs for adults, as well as parks and playgrounds for children. Welcome to the vacation you deserve! 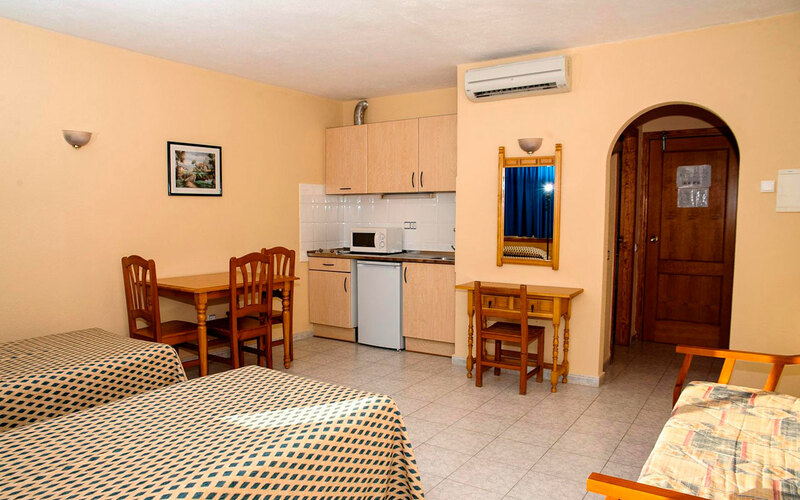 Our apartments are studio type and have a double bed or two single beds. They are perfect to host couples and also couples with children. Baby cots are available on request. They have a fully equipped kitchen, a bathroom with a bathtub and a terrace with mountain or pool views. Our studios are equipped with LCD satellite TV, air conditioning, telephone, and free Wi-Fi. 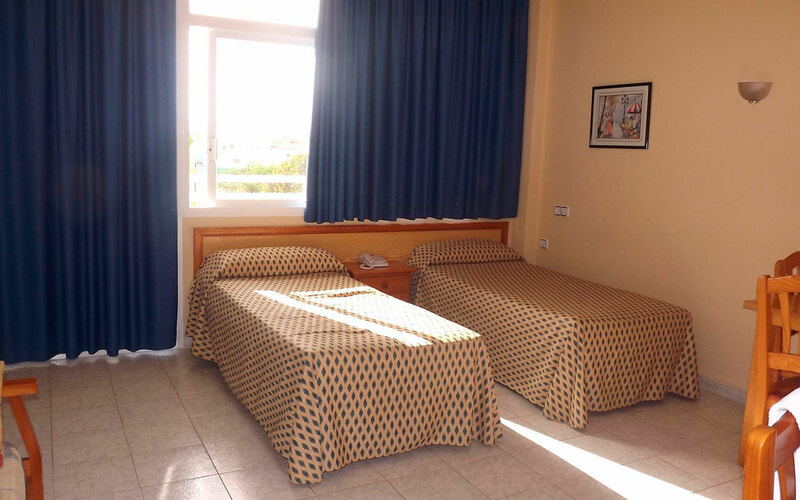 Staying at Hotel Estudios Tropicana you can enjoy a wide range of services, to make your stay comfortable and comfortable. There is a 24-hour reception, a currency exchange facility, a tour desk, a car and bicycle rental service and a tour service. Check in at reception and our staff, attentive and helpful, will provide you with the information you need. Here you will also find ample garden areas, swimming pool for adults, children's pool, mini golf and solarium terrace with hammocks and umbrellas. 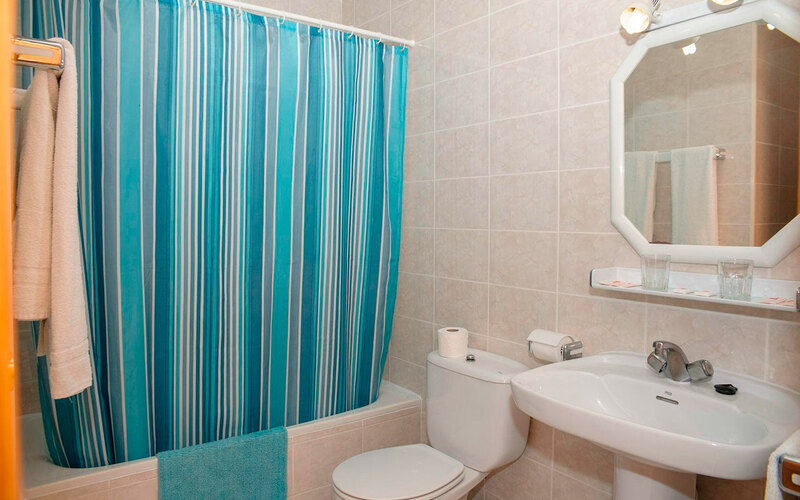 Enjoy the independence of an apartment with all the amenities of a hotel! 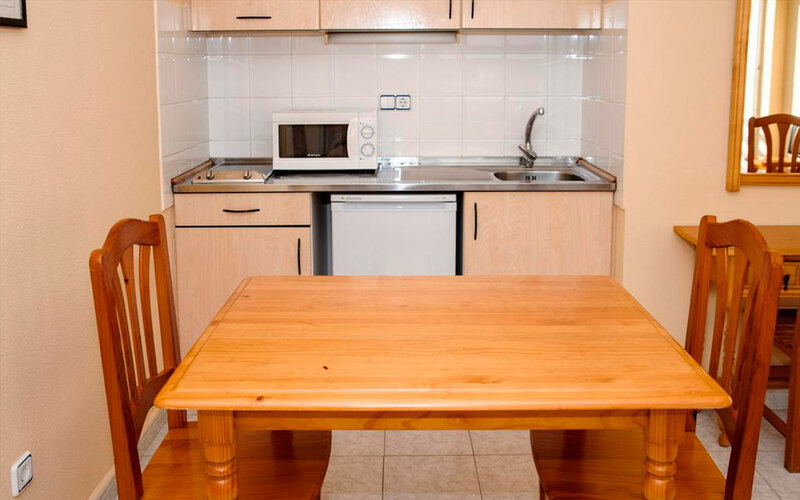 Are you looking for an apartment in Ibiza? Do you want to enjoy a quiet and relaxed holiday? 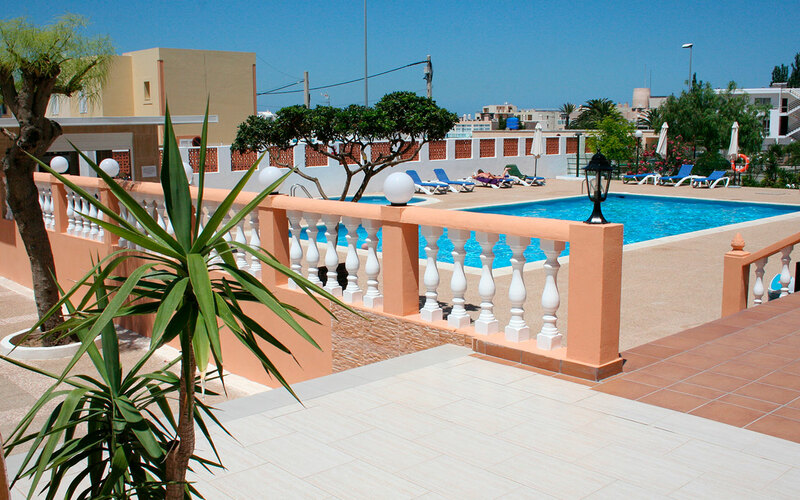 Our apartment complex is located in one of the quietest areas of the island, close to the airport and the best beaches. We have a children's pool, crib for babies and spacious garden areas for children to play. In addition, the area of ​​the bay of Sant Antoni de Portmany has various entertainment options for children. 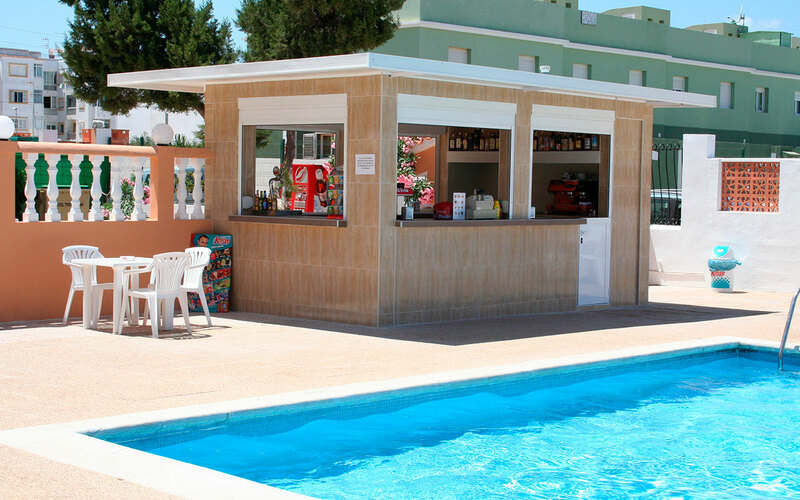 For this reason, the Hotel Estudios Tropicana is ideal as an accommodation during your family vacation. The Hotel Estudios Tropicana is located in the bay of San Antonio, an area known for being one of the most beautiful on the island. Ibiza has numerous enclaves of interest, such as its coves with crystalline waters and turquoise, its spaces of overflowing nature or its cultural heritage. The island, declared a World Heritage Site by Unesco, is also ideal for enjoying tranquility and calm. 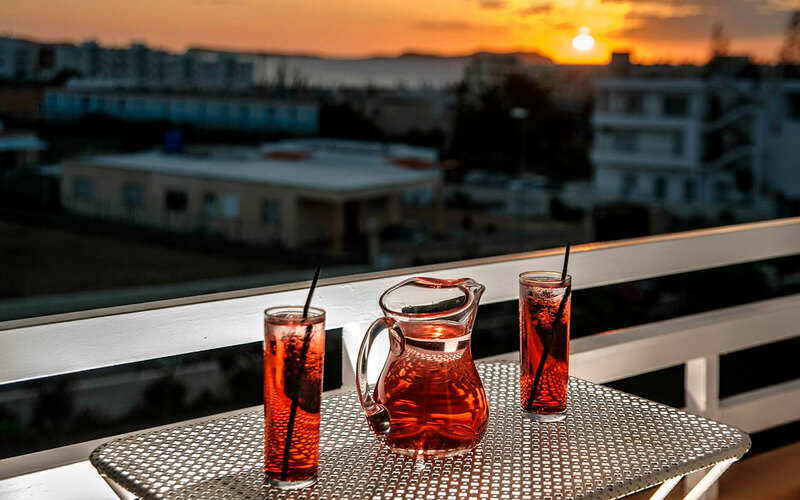 Book now your stay with us and enjoy an unforgettable vacation by staying at our hotel in the bay of San Antonio, Ibiza. 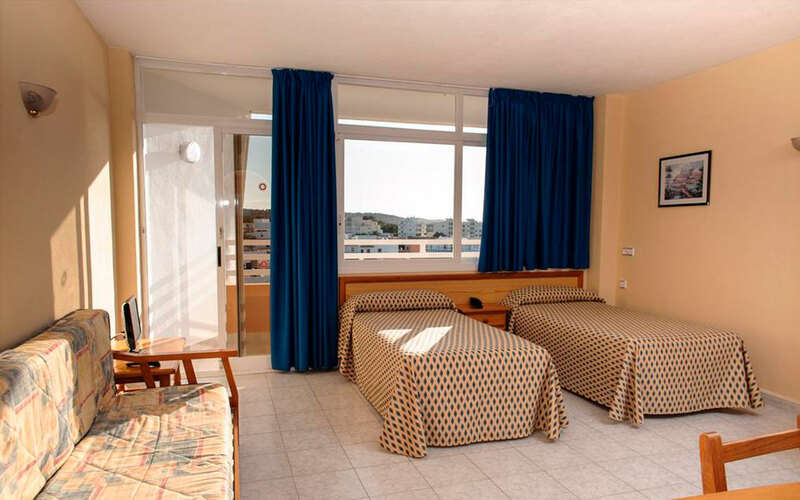 If you are looking for a place to escape from the stress of your daily routine and enjoy your holidays in Ibiza with complete tranquility, the Hotel Estudios Tropicana, located in the bay of San Antonio de Portmany, is undoubtedly your best choice. The sea is only 350 mt, so guests can enjoy water sports in the area. Port des Torrent beach is approximately 1.5 km away. And 15 Km. From the city of Ibiza.